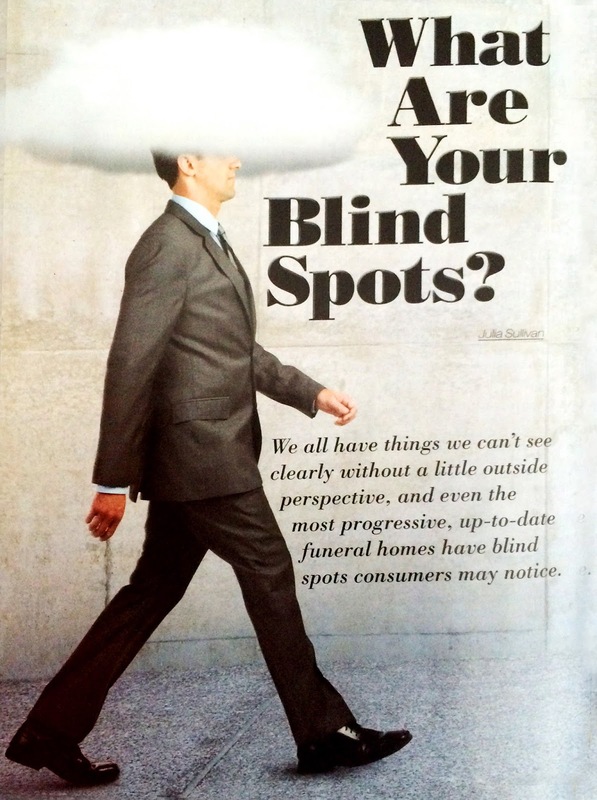 Trigard Burial Vault and Funeral Service: What are your blind spots? This article originally appeared in The Director. This year, my local newspaper published a disheartening story about a funeral home located about 40 miles from my house. It involved a funeral director with a suspended license. There’s no need to share the details of his abominable behavior. For the record, I know that unethical people with suspended licenses are NOT the people who are reading this article. It’s quite the opposite. If you’re taking the time to dig into an industry publication, I know you are committed to lifelong learning. You know that each family you serve has one chance to say goodbye to their loved one, which means you only have one chance to get it right. You’re not just one of the good guys (or gals); you are dedicated to the profession and to quality service. And yet, as I read the newspaper article, even though the things that this funeral director did were despicable, I focused in on the quotes from the family. I wanted to hear their perspective. One quote stood out to me. It was practically a footnote, but it leapt off the page as I read. Seems pretty harmless, right? In fact, catalogs are pretty standard fare. It’s just not possible to have every product available in a selection room. But something wasn’t right for the family. Even after their ordeal, as they retold the story to the reporter, it made a big enough impression on them that they mentioned it. And the reporter, in turn, decided to include it in the story. Even the editor kept in this small detail that seems arbitrary. Think about your own funeral home. Would you ever imagine that the way you present your urn options could have a lasting impact? I was genuinely surprised. It got me thinking about the tools manufacturers create for funeral homes to help families select products. When you look around your funeral home at your marketing and selection room tools, what do you see? There’s the catalog of cremation options you’ve used for years. You can find anything in it in seconds flat, which you know families appreciate. Those are the miniature vault samples you’ve always had. You can’t count how many families have chosen a vault using them as a guide. Look at the casket end-cuts. You clean them every single day to keep them looking great so families can run their hands over them without picking up a single speck. If you had an open house and invited the community, what would people think as they explored? Would they think that your reliable catalog looked like it was designed a decade ago? Would that make them wonder if there haven’t been any new ideas or products in ten years or more? Would they be concerned that there might be new products, but it looks like your funeral home sticks with things that are older? When they see the miniature vault samples, would they understand what they are if you’re not there to explain? I’ve heard so many stories of families seeing miniatures and wondering if they’re for babies or for cremation. And then they see your pristine end-cuts. Their spotless condition might not be impressive to them, because they expect your selection room to be spotless. In their minds, it’s a given. But then they might start to wonder why the end of the casket is so important. Every time they’ve gone to a funeral with a casket, they mostly see the side. As your visitors try to imagine someone in the casket, it might feel more like a city morgue from a TV crime drama with bodies sliding in and out of drawers. Yikes. That’s not what you meant for them to think at all. These hypotheticals will make some funeral professionals feel defensive. I’ve had this conversation at national conventions and have heard some insist that “their” families wouldn’t ever think any of those things. But if you’ve made it this deep into this article, I’m confident that you’re not in that category. You’ve probably already thought about some of these things, and you’re likely doing many of them differently. We all have things that we can’t see clearly without a little outside perspective. 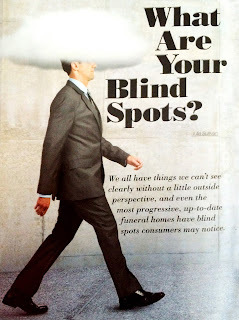 Even the most progressive, up-to-date, stellar-satisfaction-survey funeral homes have blind spots. The newspaper article I read earlier this year was the nudge I needed to look at some of the top tools that we customize for funeral homes differently. This article can do the same for you. One of my mentors once said, you don’t know what you don’t know. It’s easy to see all of the things that you’re already doing right, but it’s nearly impossible to understand what could be improved if you don’t think it needs improvement. The best way I know how to see your own blind spot is to bring in some outside perspective. Do you know someone in your community (but not in the funeral profession) who, like you, has a reputation for stellar service? Could you trust each other to be that set of fresh eyes? Do you have a friend who has never needed to make arrangements with you? What would happen if you invited them in to look at what you do to see if anything stands out before they need your help?